LiveWell’s School Food Initiative is happy to provide a variety of resources for our partners in school food, including practical ideas to increase school lunch participation, promotional tools to market progress within Food & Nutrition Services, and templates to help organize parents, students and community members around scratch cooking efforts. Please contact us for the Spanish version of any tool below. For recipe and menu cycle ideas, visit The Lunch Box, presented by our partners at the Chef Ann Foundation. 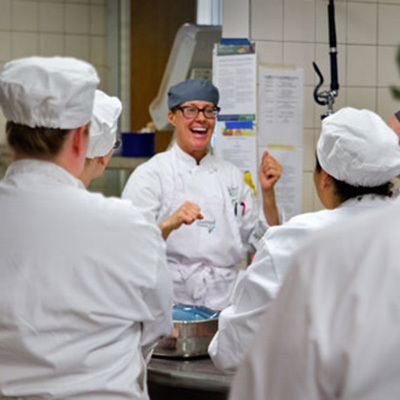 LiveWell’s School Food Initiative connects participants with the people, tools, and knowledge they need on-site, in their own kitchens, to maximize student potential through wholesome and nutritious school meals. Collectively, we can reinvent school lunch to make it the best and healthiest meal in town. The second video in the Learning with Leaders series is out! This video features Food Service Professionals from around the state sharing why marketing matters to them, their favorite tools of the trade and the benefits of building community support. In this first Learning with Leaders video Dan Sharp, D-51 Food and Nutrition Services Director, explains the tough but important work of school lunch staff in Mesa County School District to help provide healthy, tasty school meals made from scratch. *User acknowledges and agrees that LiveWell Colorado is the sole and exclusive owner of all materials and all rights granted therein under United States and international law. User agrees to only use the materials provided that LiveWell Colorado is cited and the copyright logo remains. User may not copy, distribute or otherwise transfer the materials without the express written consent of LiveWell Colorado. Click here to watch the webinar on YouTube or download the PowerPoint slides below. School Food Initiative Webinar #3: Plan Your Campaign! Click here to watch the webinar on YouTube!